This presentation will help processing tomato and fresh market tomato growers, tomato hybrid seed producers, consultants, and other practitioners around the world, to recognize, monitor, and manage bacterial canker of tomatoes, one of the world’s major diseases of tomato. Control of bacterial canker is based primarily on the use of bacterial canker pathogen-free seeds and field sanitation. The most effective controls are those, which reduce initial inoculum. However, the capacity of bacterial canker pathogen to exist superficially on tomato stems as an epiphyte weighs heavily against its control. Furthermore, the difficulty of recognizing the disease in tomato plants growing under stress conditions makes its detection difficult. Incipient or mild symptoms on the foliage may easily be overlooked as an injury caused by excess fertilization or by applied pesticides. Delay in detection of bacterial canker where regular handling of the plants in cultural operations is required (such as pruning, emasculation, pollination), often results in extensive and rapid spread of the disease. 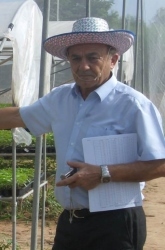 In this presentation we will discuss symptoms to look for in recognizing the disease and how to manage the disease once it has been identified to be present in the field or in the greenhouse.